Today at the University of Nebraska Medical Center in Omaha Nebraska, the 2018 National Modeling & Simulation Coalition (NM&SC) opened its doors under the leadership of the National Training & Simulation Association (NTSA). This two-day event is designed to bring together nationally recognized leaders in simulation modeling from across multiple disciplines including automotive, aviation, military, healthcare, mining and more, to connect and learn from educational training peers, industry partners, and leading experts. The event was hosted by Interprofessional Experiential Center for Enduring Learning (iEXCEL) through UNMC, and National Strategic Research Institute (NSRI). This year’s event focused on healthcare with the highlight of the iEXCEL center, which is committed to a transformative model for health professions education, training and research. The center supports a wide range of simulation and visualization technologies, iEXCEL promotes experiential learning to achieve the vision of Global Leadership in Improving Human Performance and Effectiveness in Health Care. Through iEXCEL, UNMC will accelerate the adoption of simulation and visualization technology and reshape the way in which health care education is delivered. 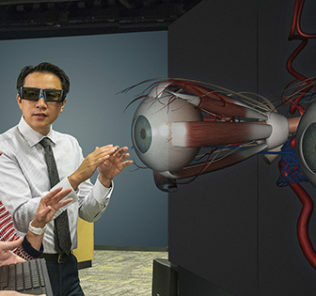 Three floors, each dedicated to a different aspect of experiential learning: Visualization floor, including 3-D-augmented & virtual immersive reality, multi touch digital iWalls providing distance collaboration, as well as a Holographic Theater – the first of its kind in an academic setting and the first 5-sided laser based immersive environment – iEXCEL Laser CAVE-5; advanced clinical simulation floor including realistic environments; and surgical skills floor including OR suites with 21 OR bays. The Davis Global Center was funded by local, state, and philanthropic funding; while the U.S. Assistant Secretary of Preparedness and Response (ASPR) supports and funds training and equipment utilized within the National Center for Health Security and Biopreparedness. The new Davis Global Center and National Center for Health Security augments opportunities through the National Strategic Research Institute (NSRI) and its mission to counter weapons of mass destruction and emerging infectious diseases. The Davis Global Center provides education, training and research resources & expertise to aid faculty, staff, and students from the UNMC Colleges; Nebraska Medicine; and the University of Nebraska system. Last night at the Fred & Pamela Buffett Cancer Center opening reception, UNMC Chancellor Dr. Jeffrey P. Gold joined Senator Robert Hilkemann DPM, Incumbent Member of the Nebraska Legislature from the 4th district, in an interview with HealthySimulation.com and Medical Training Magazine to reflect on the opening of the new Cancer Center building, and the support of the UNMC iEXCEL from Federal, State, and Private donors. Unique to the UNMC is the Global Center for Health Security, a hub for researching and preparedness response for bio-containment, which has partnered with National Ebola Training & Education Center (NETEC) to develop training programs, curriculum, and workshops for bio-containment. UNMC has become an ongoing partner with federal level organizations and departments like HHS which plan and prepare for national disasters in biological contamination. They also support countries around the world like Qatar and China to better bridge international training initiatives. Legislative Senator Hilkemann, a podiatrist, medical educator, and pilot understood from his professional experience the need to support healthcare education specifically through simulation. He shared that gaining support for the center for funding the collaborative project was almost instantly bought into by his legislative colleagues because of the early support from philanthropists matched with the obvious benefits inherent with modernizing healthcare training through simulation. Dr. Gold further supported the fabulous philanthropic community of Omaha Nebraska to support UNMC, with a sophisticated understanding that the ongoing operational costs were a key factor in gaining financial support. Thus, a partnership between private donors, state funding, and federal investment came together to support the short-term building construction and the ongoing operations of the program for the long-term. 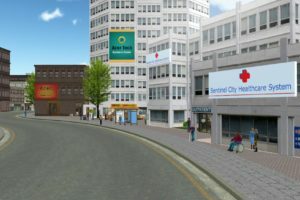 Dr. Gold furthered that to prepare for the launch of the building, the UNMC team had already developed programs like the Eon Reality Academy to provide young people and adults with an opportunity to create VR / AR technologies, alongside remote instructional training opportunities for 6 different nursing campuses over 500 miles apart. Senator Hilkemann agreed that such programs are crucial to supporting rural education across the state as the population moves. The question was asked to Legislative Senator Hilkemann why Medicine was still so far behind the mandated use of simulation aviation, he reminded us that new “Technology is coming in this emerging field and we need to do more”, which is why collaborative projects like the iEXCEL collaborative project will be “so important” to furthering the support regionally and nationally. Dr. Gold furthered that simulation is a component of improving training, sharing that his talk will help show why “Change is culture” and that advances in the mandated use of simulation are starting to occur, like in the accreditation of anesthesiologists during board certification where so much “technology meets medicine”. The NM&SC is a national organization dedicated to the expansion of Modeling & Simulation products, services, tools, processes, and technologies.  Throughout this website, you will find information on the Coalition’s activities, past events, current initiatives, our leadership, and our events. The 2018 National Modeling & Simulation Coalition National Meeting centers on the theme of Improving Human Performance & Effectiveness, will feature world-class keynote speakers and highlight four engaging panel sessions led by subject matter experts in the fields of simulation and visualization. 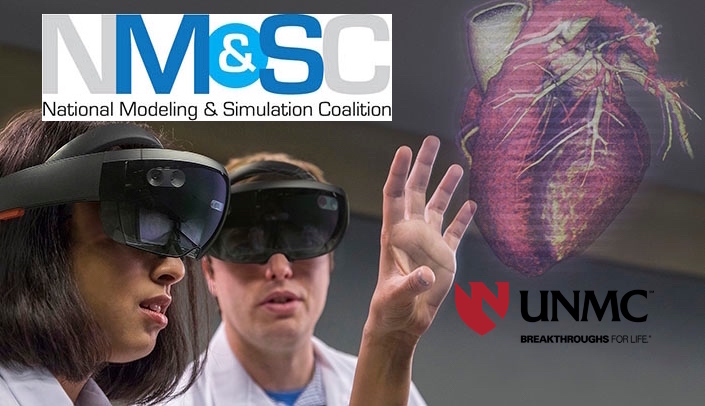 During the meeting, attendees will be exposed to a number of exciting and innovative areas at UNMC, including the iEXCEL Visualization Hub and the Sorrell Clinical Simulation Lab, and the SIM-NE Mobile Education Unit. Construction continues on the Davis Global Center, a new ‘state-of the-art” facility opening in Summer of 2019. As the new headquarters for iEXCEL, the Davis Global Center will provide almost 200,000 sq. ft. of clinical simulation, surgical skills training, and advanced visualization space. Here below, Pamela J. Boyers PhD, Associate Vice Chancellor for Clinical Simulation for iEXCEL interviews Dr. Gold about the NM&SC meeting. Lt Gen Bob Hinson, USAF (Ret. ), Founding Executive Director of the National Strategic Research Institute (NSRI), was on hand to represent NSRI, which was approved by congress and supported by STRATCOM to combat weapons of mass destruction through research at the basic and applied levels across levels of defense and preparedness against biological, chemical or nuclear attacks. 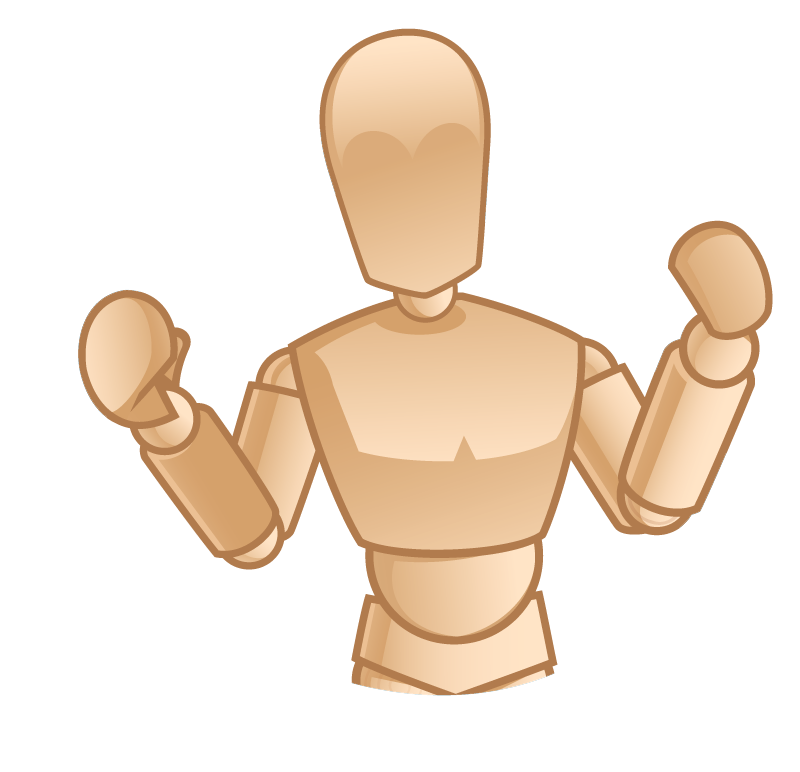 Bob was excited to see that the learned lessons from military training of saving resources and increasing fidelity is now advancing in the medical fields. Panel #1: Human Performance & Effectiveness: MS&V – Training to Competence, moderated by Dr. Winston ‘Wink’ Bennett, WPAFB. UNMC Chancellor Dr. Jeffrey P. Gold took the stage after lunch to share how the organization is supporting NM&SC to better the human condition and to strengthen the National well-being through clinical, educational, and research missions. While reminding us that the “see one, do one, teach one” model has been in medical education for over a 100 years, he said that March 22nd, 1977 was a crucial date for healthcare to consider: the day of the Tenerife Disaster when two 747s collided on a runway killing over 538 people. While tragic, it was an eye opening day for the aviation industry which has since gone from 1 death per million miles flown in 1977 to less than 1 death in every 1 billion miles flown in 2015. He concluded that culture change provided for this massive improvement. He then began to compare the aviation industry to healthcare. Whereas in 1977 hospital medical errors were the ninth cause of death, the situation has worsened and medical errors are now the third leading cause of death in the US. And while performance has fallen, costs have skyrocketed. Furthermore, in other industries like commercial, military, & private aviation, oil, gas, mineral, road, and rail – the majority of educational training takes place through direct experiential simulated learning — unlike healthcare which still primarily teaches in didactic reading. Summarizing, he shared that in healthcare: access is too hard, quality is too variable, cost is too high, system is too complex and the workforce is inadequate — saying that there is a significant opportunity to improve the healthcare system. Quoting Roosevelt, he reminded us “that this is not the time for incremental change, and that we need to dare to do mighty things” and that is why UNMC is doing what it is. 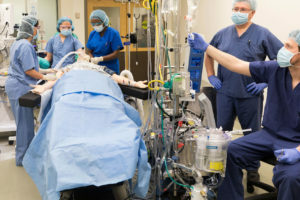 The private and public investment is designed to provide quality and safety of health care, health care educational opportunities, interprofessional team based training, attraction of faculty & learners, continuing professional development, new technology development, regional economic development and national health security and biocontainment opportunities. Dr. Amyot started his talk by reminding us that although its considered as one, healthcare is not a high-reliability industry as considered by Dr. Niels Bohr who said that “An expert is a person who has made all the mistakes that can be made in a very narrow field”. Thankfully, a massive driver in healthcare change is coming from the way hospitals will be reimbursed for care, which used to be based on the quantity of care delivered, but has now moved to quality of care. By penalizing the 25th lowest performing hospitals, $3B in U.S. government reimbursements will not be provided by end of 2019. All personnel have authority/responsibility to adjust operations in real-time for safety. If just 1% of flights had accidents, over 2,000 airplanes would crash a day. Certainly we don’t accept such results in aviation, so why do we in healthcare? In aviation, training is adaptive and closed loop based on actual Flight Operations Quality Assurance (FOQA) data, which is then translated into Simulator Operations Quality Assurance (SOQA). Dr. Amoyt argues that the same type of closed loop training should be accomplished in hospitals – capturing data from actual patient care and then after analysis, creating ongoing training programs that match intended and expected outcomes that closely match practice. 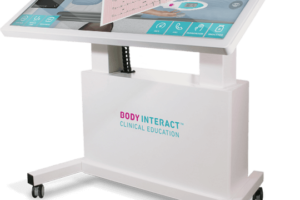 Tools like gamification and augmented reality are helping to move healthcare education and training in new ways. 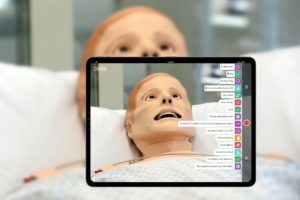 He then shared how products like the CAE Healthcare LucinaAR Augmented Reality Simulator are enabling learners the highest level of realism ever provided for emergency medical procedures like shoulder dystocia. 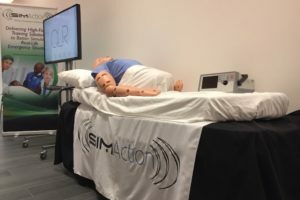 @NDIAToday, @unmc, @UNMC_iEXCEL, @NSRI_NU, and of course @HealthySim!